I must strongly protest your poking fun at a religious icon. Such activity is crude recidivism (whatever that means) at best. 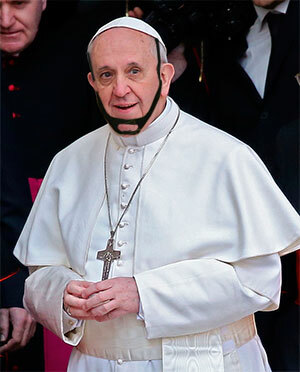 I fervently hope you will have learnt your lesson, and will leave the Holy Chinstrap alone in future. Dear Rt Rev Malc – Did you know Jesus drove out the moneylenders whilst wearing a chinstrap? That’s just silly. J. didn’t have a driver’s license. Definitely a better look for Pope Francis than Prince Charles. 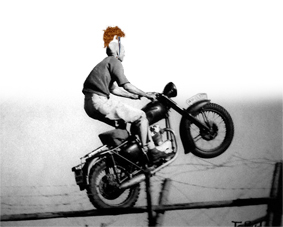 I need one of those chin straps… got one in a Jay Leno size? Charles oddly looks like that Cheshire Cat in Alice and Wonderland…but maybe he just looks oddly. The cat’s got his tongue? 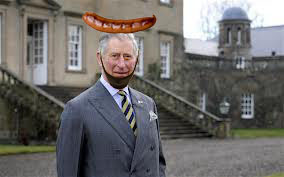 I think if Charles would just stick to the sausage and not insist on further accessorizing with the chin strap, the Queen might be more inclined to give up the throne. It’s obvious that she’s stalling because she thinks William can wear a chinstrap and still look good with a crown, and also, poor Charles. Sweet! I guess I’m not the only one who took a blog breather. I am in awe.Just awe, at the things you can get the great and good to do. Ah, I have missed the Gingerfightback.